Paper • ISBN-13: 9781560256311 • US $16.95 • 9.0 in x 6.3 in • 481 pgs. 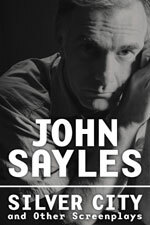 Legendary filmmaker John Sayles has been called the “conscience of the independent film world” in the United States, and the “screenwriter’s screenwriter.” Silver City and Other Screenplays is a collection of his greatest work, including Sunshine State, the Oscar-nominated Passion Fish and his film written for the U.S. election year in 2004, Silver City. Set in Colorado, the core of America’s “New West,” during the state’s gubernatorial race, Silver City is a spirited lampoon and a timely, toxic warning about the present state of American democracy. The grammatically challenged, born-again candidate for governor is the scion of a formidable right-wing political dynasty. He is fumbling his way toward elected office when an unexplained corpse emerges to threaten his campaign, the family empire and the special interest groups who pull his strings.